New Panthers rider Tom Bacon. A man with a degree in business management should expect to have to make tough decisions – and that’s certainly been the case for Tom Bacon this winter. 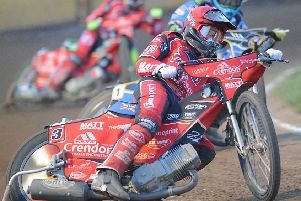 The new Panthers capture will race at SGB Championship level for the first time in 2017 after being snapped up as the club’s compulsory British reserve. And a desire to be a success on the shale has led to Bacon giving up a career as a business development boss to devote all of his time to speedway. “The goal is to go as far as I possibly can in the sport,” said Bacon, who was working for his main sponsor, Telent. “That’s why I’ve given up my job to race full-time. “My schedule is so manic that, when I sat down and thought about things, I didn’t really have any choice. “I’m expecting to do around 80 meetings this season and it would have been impossible to combine that with a career away from speedway. “Last year I was often working until 5pm, jumping in the car to Birmingham and then racing a 500cc motorbike with no brakes. That certainly wasn’t ideal, but I’m now able to prepare in the right way. “I can go for a run in the morning, eat healthily during the day, arrive in plenty of time for meetings and give myself the best possible chance of being successful. Bacon is gearing up for just his third full season of racing. The 24 year-old didn’t take up the sport until he had completed his university studies, but he has quickly established himself as a promising talent. Bacon raced in the National League level for Mildenhall in 2015 and Birmingham last year. He will continue in the third tier for the Brummies again this term in addition to taking on the challenge of SGB Championship action with Panthers. “It’s a big step up for me,” admitted Bacon. “But I’m in a team where I can learn from the other six guys and that’s only going to benefit me. “You only have to look around to see Peterborough is a great club to be at. The fact it is relatively close to my base in Coventry is an added bonus.